Isamu Noguchi & Shirley Yamaguchi. This image of Isamu Noguchi and Yoshiko Yamaguchi in Chuo Koron Gallery, Japan, 1952-53 is part of an exhibition entitled Design: Isamu Noguchi and Isamu Kenmochi. 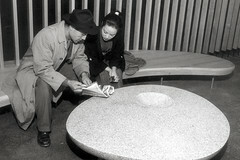 Noguchi and Yamaguchi were married from 1952 to 1957. A prolific actress (also known in English as "Shirley Yamaguchi"), she was dubbed "The Gudy Garland of Japan". Unfortunately, they were both in demand in their respective fields resulting in substantial periods of time living separately. Yamaguchi was denied a visa to enter the United States resulting in more personal and professional difficulties. Although she was eventually permitted to enter the U.S., their relationship had been strained. Each artist made their work their highest priority making it difficult for them to resolve their temporal and geographic displacement from one another. This photograph is part of an exhibit presently on display at The Noguchi Museum. The marble coffee table is on display along with other Noguchi furniture designs of the 1950s. His collaborations with Isamu Kenmochi form the nexus of the exhibit featuring rare, classic examples of their work from this period, some recreated especially for this presentation. Archival image courtesy of The Noguchi Museum (photographer unknown).